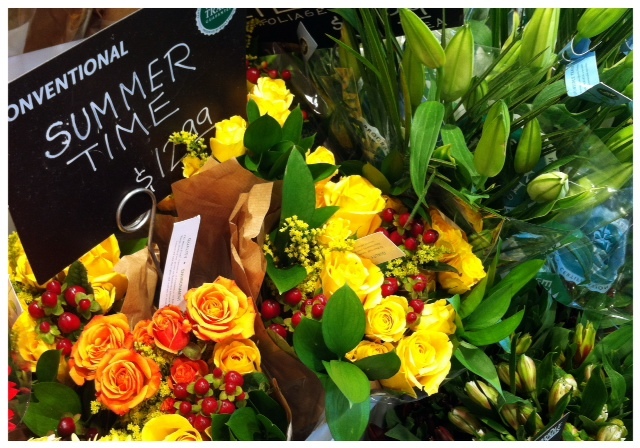 Some pretty flowers from the new Whole Foods that opened in West DesMoines, Iowa… just in time for our trip! Praise God! I just returned from a week-long trip to Iowa, where I’m originally from. But let’s be real. Moms don’t get vacations. Trips are generally for your children, or to visit other people – to make things easier on them. They are not for moms to read, relax, and refresh. This was definitely not that. One of the first evenings we didn’t get dinner until almost 9 pm, because we simply couldn’t figure out who had food we could all eat. With gluten and dairy issues… you want to make sure everyone is covered without 3-4 stops inbetween. The kids kept reminding me that it wasn’t as late as the meal we had once in St. Louis – that finished at 11pm. Thank you, you’re right… no… it wasn’t quite THAT late. Still not when I would have PREFERRED to feed my family. We have family/friends that often joke about how we’re “running behind”… and let me just assure you, it’s NOT because we’re lazy. We plan, pack, prepare, and make lists… and have everything ready to go. But when only 20% of the people are helping things move the other 80% in the right direction, it’s not as easy as it sounds. Herding cats, on a flatbed, comes to mind. Most other bigger families know what I’m talking about – you’re no longer on YOUR time. Whatever that is. It’s call dying to self, and we all learn it in different ways. Usually SLOWER, more painful ways. This used to really turn me into a tale-spin, and hurt me when people would ask why we didn’t leave at “this time” or that time. Now I simply realize they just have no clue. They aren’t trying to be rude. Similarly to how quickly you’re out of touch with the newborn stage… other people can’t completely understand your struggle, unless theirs is similar. Which makes me wonder how the famous Duggar family EVER leaves their home! If I could pick up my one suit case, a piece of toast and head out the door – that would be the life – Right? Breakfasts weren’t difficult, and lunch on the go is a cinch as well… but figuring out a hot dinner around our already “difficult to get anywhere QUICKLY” family – is sometimes tricky. On “our trip we call vacation” – our days goes something like this – up at 7am, yogurt in the room (get bowls out, feed littles, feed self, clean up mess), dress children and do the hair on 4 little girl heads, then I get ready, then we go downstairs to breakfast. Eat breakfast for 45 minutes and back up stairs for potty breaks and brushing of teeth… another 30 minutes later we pack the coolers for the day, see what we need from any store -and head out. Grab things needed at stores…. It’s now around lunch time. At any rate, the trip was worth it, and a little part of my heart breaks when we have to leave again to return to Kansas. I wish “home” wasn’t so far away from my first home and so many people I love, and love to be with. The kids had a great time, we were all healthy… and safe… and we saw family, and made some delightful memories along the way. Several of which I’ll be sharing, right after I un-bury myself from this laundry pile. Posted on August 14, 2012, in Change, Diet, Our Struggles and tagged healthy for him, healthyforhim, trips with gluten intolerance, Vacation with celiac disease. Bookmark the permalink. Leave a comment.